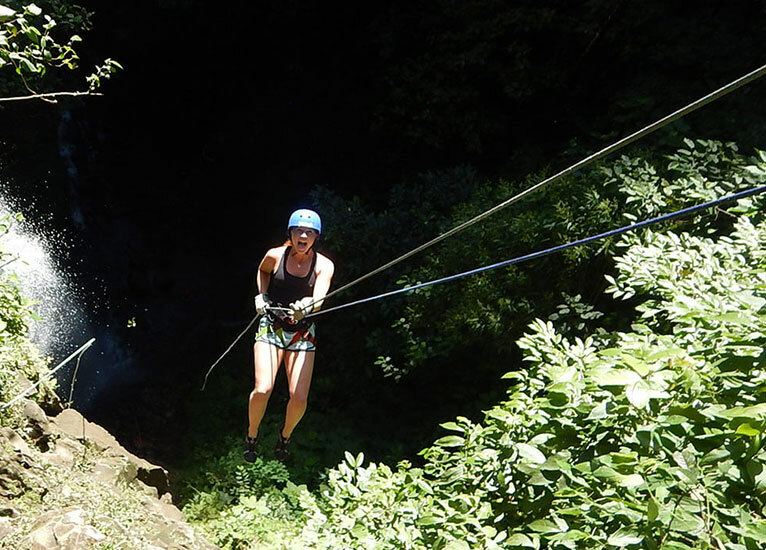 Visit two of the most popular activities Costa Rica- adventurous canyoneering and a leisurely horseback ride to the breathtaking La Fortuna waterfall! 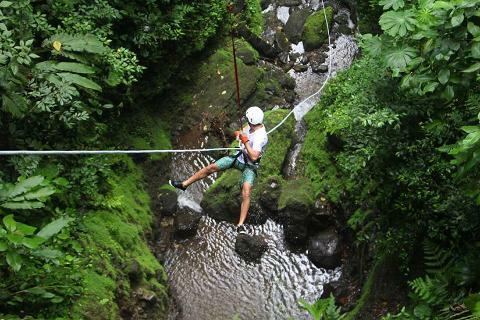 The Lost Canyon is situated deep into the Costa Rican rainforest. To get there you’ll take a 4x4 ride through the rolling hills of the gorgeous Costa Rican countryside. When you start your adventure, you’ll find out that canyoneering is more than just repelling; it’s a full-body work out! You’ll use your arms, legs, and hands to climb through Mother Nature’s obstacle course - jumping into pools, sliding down a natural water slide, sitting under waterfalls, pulling yourself up some rocks and helping yourself down others. Then, finish your adventure with a 200 ft waterfall drop -- repelling part of the way and then letting go of the reins to experience a guided free fall drop! Talk about adrenaline! Walk back up the canyon to our Canyon Café and enjoy a delicious lunch we call the famous WARRIOR BUFFET before heading to the ranch for horseback riding! Upon arrival to the ranch you will be introduced to your horse and guide who will provide safety instructions and tell you about the route you are about to take. 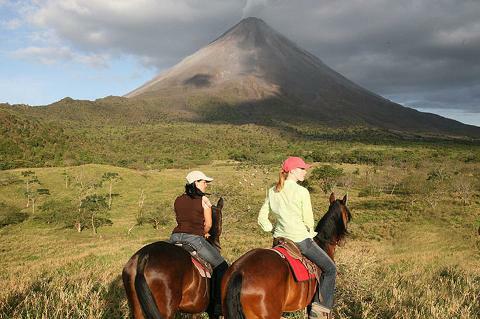 Along the way, your guide will point out wildlife, and you will get to see beautiful views of the green countryside and the breathtaking Arenal volcano. 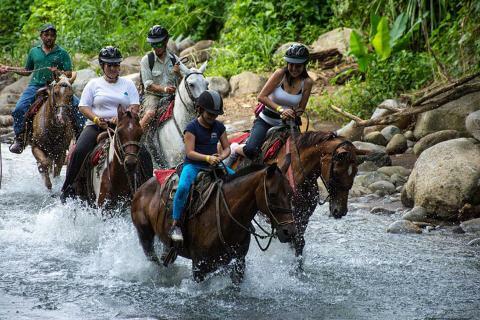 When you reach the entrance to the waterfall, you will "park" your horse and head with your guide down to the La Fortuna Waterfall. 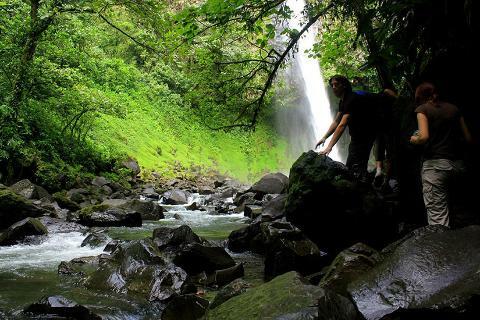 There are 300 steps to get to the famous La Fortuna Waterfall and 300 to get back up! When you reach the bottom, you'll have an opportunity to take lots of pictures and swim in the cool waters of one of the largest waterfalls in Arenal. to bring a little extra money to buy some authentic Costa Rican souvenirs!